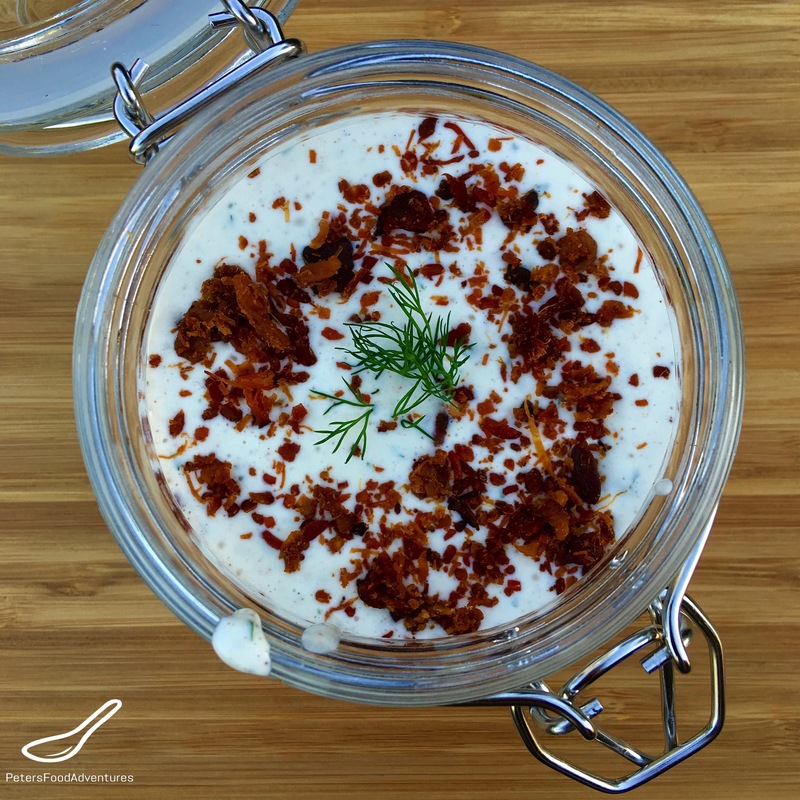 This is the best Bacon Ranch Dressing & Dip recipe (made with buttermilk) that I’ve ever made. Sometimes it’s just nice to have a homemade salad dressing, one that’s full of flavor, easy to make, and not out of a Kraft salad dressing bottle. Since moving to Australia, I sure miss the variety of selection of salad dressings that are available in North America. I’ve even learned how to make my other favorite dressing, Creamy French Dressing. In Australia’s defense, we have in the last few years gained a few more varieties of salad dressings, usually driven by store brand offerings in our supermarkets. I think it’s cultural here in Australia, not to drown your salad with a dressing. Many times we’ve been invited to an Aussie’s home for dinner, and the salad is served dry, without dressing. It’s not a mistake, but just how many people enjoy to eat a salad here. That’s definitely not me, I am a product of a sauced-up North America. This Bacon Ranch Dressing is easier to make than you would think, and tastier than store-bought varieties. Simply whisk together all the ingredients and you are done! I buy Hormel Real Bacon Pieces, (not bacon bits) in a glass jar from your supermarket, instead of real bacon. It gives the right consistency and smokey flavor to the dressing. You can use real bacon, but needs to be cooked well and evenly. I find this hard to do as some pieces are too chewy, others too burnt, plus the extra bacon fat in the dressing. This recipe also doubles as an awesome dip for chopped vegetables, chicken wings, chicken strips, roasted potato wedges, and I even dip my pizza crusts in this sauce. 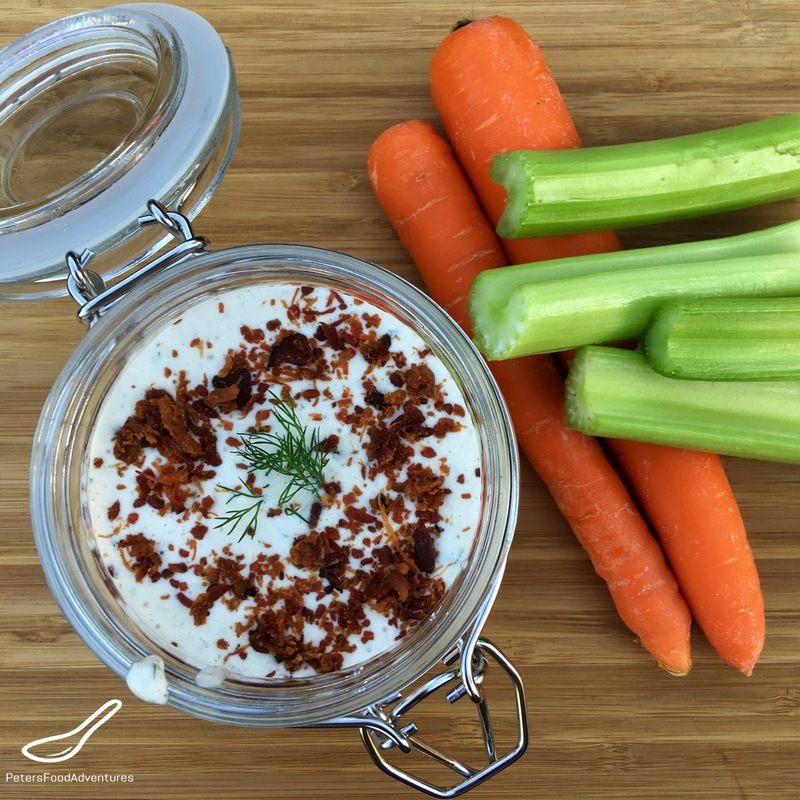 My Bacon Ranch Dressing & Dip (made with buttermilk) is super easy to make, rich in flavor, and calories too (but totally worth it). Bon Appetit! Приятного аппетита! Homemade Bacon Ranch Salad Dressing & Dip. Made with Buttermilk, tastes 10 times better than store bought. So easy and delicious you'll never buy Kraft again! Whisk all together except for the bacon bits. You can use an electric mixer, but I just used a whisk and vigorously mixed together in a bowl. Add the crumbled bacon bits and mix throughout. Best to refrigerate for a few hours before use, but I usually can’t wait and eat it right away! Enjoy! I’m with you I love a dressed salad even if just olive oil and vinegar and lemon. Your dressing sounds amazing I really love ranch dressing. I love it for a crudités platter or dipping chicken tenders or even French fries. Delicious. I am totally with you on making dressings and dips homemade. This looks so flavorful! My daughter would love this! Homemade is definitely the best! Somewhere there is a happy medium, too many dressing here in the States and not enough in Australia. It seems like there is always something new, at least 20 varieties of ranch alone. I don’t think we really need that many. Yes, I think you are right. When we were there last, it was a bit overwhelming to see all the flavours, it did make me wonder if so many were necessary! But homemade is still best! ???? This sounds soooooo GOOD !!! !